German Shepherd dogs are fun-loving, energetic, and loyal friends of the entire family. First bred out of Germany at the close of the 19th century, the breed was derived from farm and herding dogs and thus became known as "German Shepherds". Known and bred for their intelligence, German Shepherds are active and display a strong sense of curiosity and a marked willingness to learn, along with a corresponding temperment for obedience. They also can be very protective, which makes them good guard dogs, patrol dogs, and police dogs. German Shepherds surged in popularity in the USA following World War I, as soldiers returning from Europe spoke positively of the dogs after their seeing their use as sentries, messengers, scouts, and in patrol units. The film stars Rin Tin Tin and Strongheart also added to their popularity. Today, German Shepherds are the second-most popular dog breed in the United States, and the fourth-most popular in the United Kingdom. Any family with a German Shepherd can provide countless reasons attesting to why they are beloved as family pets, and our new line of German Shepherd urns offers a beautiful way to honor and remember a wonderful pup. 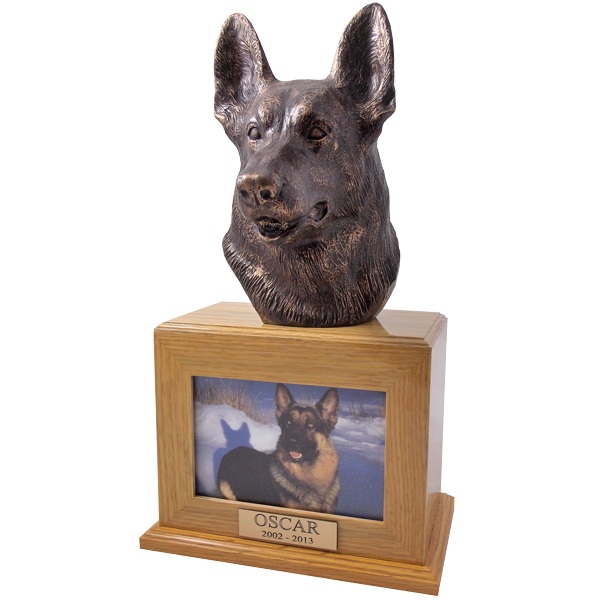 These cremation urns are made in the USA from your choice of solid wood, and include a beautiful cast bronze sculpture depicting a German Shepherd. Personalization options include photo frames and engraved name plates. The "horizontal" wood urns are built with a picture window, while the "vertical" German Shepherd urns can include an optional magnetic photo frame.